Kangaroos are probably one of the worlds most adored animals, they even feature on Australia’s coat of arms. To us Australians though, they are just locals. Let me share with you a couple of meetings with these locals. I was out walking with the wuppies yesterday and we were nearly home when I met one of our neighbours who was commenting “There’s a whole family of them just over there”. Over there was across the fence at the back of his house which separates the estate from a swathe of bushland. The wuppies wanted to get a closer look so I walked around the other side of his property into the park which also adjoins the bushland fence. As we got closer to the fence one big roo who was obviously the dominant male of the group stood up from his prone position to inspect what was coming towards them. As he did a number of other kangaroos appeared from their positions lying in the long grass. I hadn’t realised that there was as many as there were. There must have been at least six others and they all started to hop away into the trees further away from us while the big male still stood guard as it were. When he was satisfied I guess that everyone had got clear he just simply pivoted on those enormous back feet of his and went straight into the most fluid, smooth, hopping run as if he was flying across the ground and was into the trees in a matter of seconds. I stood transfixed in admiration of the smoothness of his whole movement including the pivot on his back feet. It wasn’t one step left then the other left, it was both feet in a smooth left turn and without a pause, was into his flowing motion. It is difficult to describe it as hopping because there is no discernible difference between one hop and another, they all just flow together like a highly trained field and track runner’s movement might. It was just a delight to watch. The wuppies by then were not quite as dumbstruck as I was, they were barking away trying vainly to convince anyone listening or watching that they are really vicious wild animals prepared to attack at any moment. No-one believes them of course. We see some kangaroos around us from time to time and quite a few used to frequent a large empty space on the other side of the estate. Recently though this area has been cleared for the construction of warehouses and a road running along the back boundary of the estate. I did get a photo, see above, of a couple of them on the razed dirt forlornly it seemed picking away at what used to be a good feeding area. That was the last time I have seen any in that area which is a little sad really. The effect that humans have had, quite unwittingly it seems, on the rest of life in this wide brown land is at times tragic and deplorable. We had our own “up close and personal” moment with a kangaroo earlier this year. 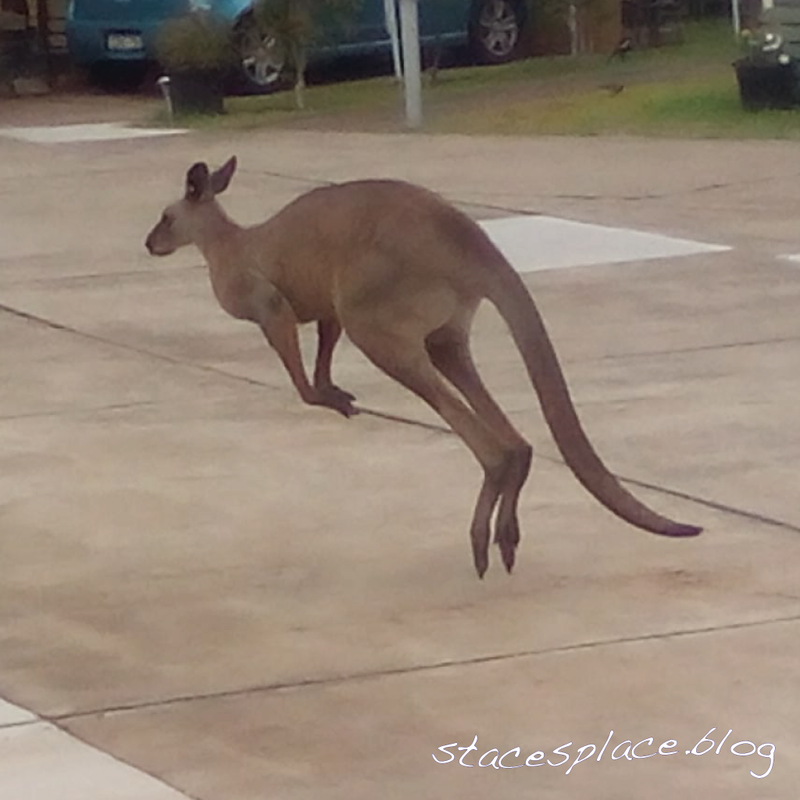 One big kangaroo came down our street and presumably turned left too soon. 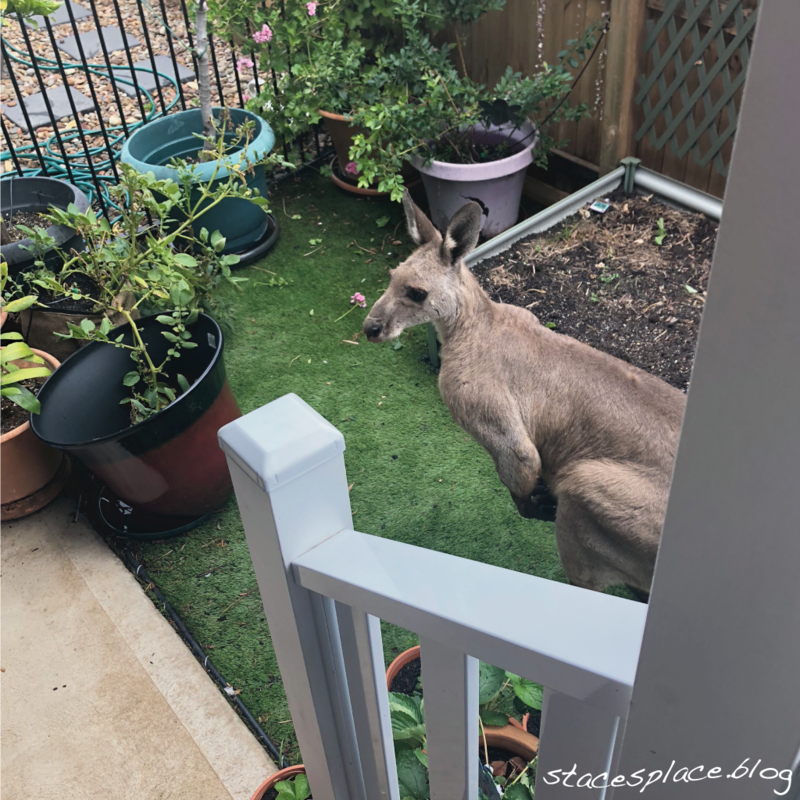 Our neighbour had left her garage door open and the kangaroo mistook this opening as the end of the street and found himself in her backyard. Now he knew that he had to keep going in his original direction to get to the cross street at the end of our street so he proceeded to hop through her yard, over the small fence between her backyard and ours, and was hopping his way through our narrow yard to try to get through to the street which he probably could see a little of at the end of our yard. 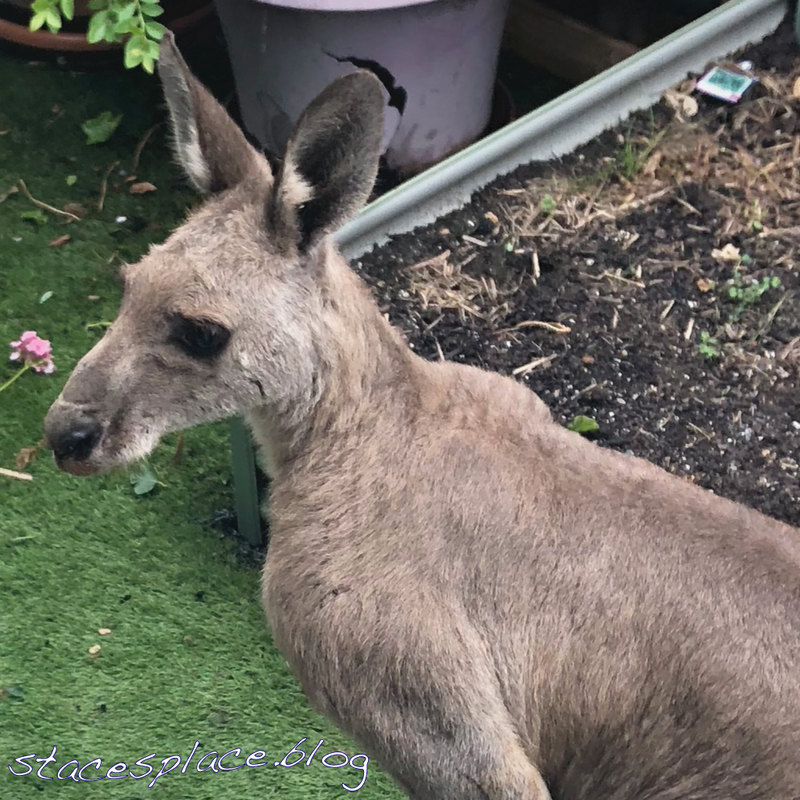 He was deterred however by the shed we have against the fence at that end of the yard so he turned around and retraced his hops, not steps, until he got to the end of our house and was looking left at our garage door when I took the photo below. He then proceeded to calmly jump over the fence again and head up through the neighbour’s yard, out through the open garage and back into the street. They are nothing if not clever and adaptable. He proceeded on his way down our street and turned left at the bottom of our street and followed that on trying to find his way out. What is amazing is that the only damage he caused was to our blueberry pot which you can see just behind his ear. He must have just clipped the pot on the way in as he cleared the fence. The other photo below is of him bounding further down the street. A lady uploaded this on to our Facebook group page with the note that the maintenance crew had herded him safely back over the fence and into the bush. He could well have been the same one I saw yesterday with the wuppies but they all look the same when you don’t know how to look.